Yes Magazine (by Melissa Hellman). (10/04/16) — Delonte Wilkins was looking for a fresh start when he was released from Pennsylvania’s Schuylkill Federal Correctional Institution in February. He polished his resume and applied to several jobs in his hometown of Washington, D.C. But when he was turned down for three job offers once those employers learned of his criminal background, Wilkins soon realized he couldn’t easily leave his felony behind. “I’m discouraged from applying to a lot of different jobs because I already know that I’m not going to pass the background check,” says Wilkins, a certified electric systems technician. He doubted there was a space for African American workers with histories like his to thrive, particularly in Washington, D.C., where the Black unemployment rate is the highest in the country, according to a 2015 Economic Policy Council report. Seven months ago, while seeking information about black worker-owned cooperatives, he joined a labor center to learn about workers’ rights and civic engagement. The D.C. Black Workers Center, established two years ago, is where Wilkins found employment possibilities, and a place that helps to build economic empowerment for African Americans in the city. Located in the United Black Fund building, which houses Black nonprofits, the D.C. Center takes a unique approach to its job-training services by addressing the twofold crises of high unemployment among Black workers and the low wages they’re paid when they do find work. It is one of eight African American worker centers nationwide. The other centers are located in Los Angeles, Chicago, Oakland, Calif., Greenville, Miss., Boston, and Raleigh-Rocky Mount, N.C. A center in Baltimore is opening soon. The National Black Workers Center Project, a national network that supports all of the centers, is working to shift the narrative on African American unemployment, which is 8.1 percent, according to the U.S. Bureau of Labor Statistics—nearly double that of Whites. Steven Pitts, a board member at The Project, says that Black workers need to organize because they lack the power to influence public policy and attain economic freedom. He says it’s the fundamental reason for high unemployment and low-wage positions, what he calls the Black job crisis. “A closely related concern is the public narrative about [its] causes and solutions,” says Pitts, who’s also a labor economist at U.C. Berkeley. This is why one of the Project’s first initiatives, Working While Black, will feature multimedia stories on their website about African American workers and local campaigns to improve access to high-quality jobs. The storytelling initiative will launch in mid-November. The National Black Workers Center Project drew inspiration from immigrant centers that cropped up in the 1990s to offer legal services and advocacy for the influx of Latin American and Asian immigrants. In a similar fashion, the Black Workers centers use a member-led structure to address the unique challenges facing African American workers—namely racial prejudice, discriminatory hiring practices, and the disproportionately high incarceration rate. “You build the most power when people are actively participating in shaping their own lives,” says Pitts. To do this, the organizers conduct surveys and hold listening sessions to adapt to the needs of the area. After noticing that Black construction workers were not being hired to work on new rail lines, the LA Center hosted a campaign to successfully employ more African Americans in the county’s transportation projects. In Oakland, the Bay Area Black Workers Center was part of a coalition that convinced the county’s board of supervisors to vote in favor of hiring 1,400 formerly incarcerated residents for various positions with the county in June. A coordinating committee in Baltimore is also in the beginning stages of creating a labor center to address the predominantly African American city’s vast income inequality. Cooperatives allow communities to determine where they work and how much they’ll be paid. In D.C., the Center focuses on reducing the unemployment gap. In addition to job training, organizers partner with labor unions and offer construction skills trainingto increase access to higher-wage positions. Some desired jobs include railroad maintenance work, demolition and asbestos removal, and construction on federal government projects, which pay up to $30 an hour. So far, 25 members have received general construction skills training, and 10 of them were offered jobs with construction companies. They also teach members cooperative organizing. Last year, members received training in workplace democracies, in which they learned how to recruit other workers and create their own cooperatives. Lawyers explained the legal steps of developing a cooperative, and some members shared their observations from a visit to a child care cooperative in West Philadelphia. The visit has inspired some women at the D.C. Center to start a child care co-op. Delonte Wilkins, left, with another organizer, facilitates monthly meetings with Southeast residents. Photo courtesy of Dominic Moulden. Unlike other job training hubs in the city, the D.C. Center provides a space for members, at their monthly meetings, to have cathartic conversations about their work experiences. Sometimes they discuss the discrimination they face for having African American names, or talk about deconstructing Black respectability politics, in which African Americans police their own values to fit into the White mainstream. Overall, the meetings focus on topics ranging from the fight for a $15-minimum wage to organizing labor unions. Up to 40 people regularly attend the meetings, although there are about 1,200 in the Center’s database. The D.C. Center fills the gap between training and employment opportunities. Members sit around a large table wearing work attire ranging from suits and ties to auto-mechanic jumpsuits. During some sessions, labor unions conduct workshops on organizing low-wage retail workers, and familiarize workers with their rights. “The purpose of the Black Worker Center is to create a space where people build power and understand the politics of their work, where they build skills to enhance their opportunity to get good work, and where, through co-ops organizing, we can control and create our own labor,” says Dominic Moulden, a resource organizer at the D.C. Center. Moulden recruits members by walking door to door, and talking to strangers, in laundromats and metro stops. During these engagement walks, he estimates he and other members have asked nearly 100 people about their employment history and career goals. Members then brainstorm ways to offer resources related to the community’s concerns. During recruitment sessions, Moulden, who has worked in D.C. as an organizer for various social justice campaigns for the past 30 years, discovered that some workers with low-wage jobs had received multiple certificates and ample training, but they were still unable to get ahead. “People were trained to death, but still unemployed,” he says. So, they partnered with the construction worker union LiUNA, the Laborers’ International Union of North America, to provide members with training on construction and asbestos removal. 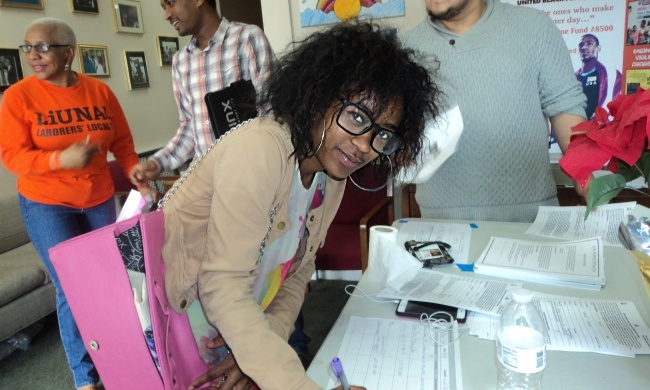 In March, the labor union held an intake session for D.C. Center members and connected them with companies that offered 10 jobs. Raymin Diaz, a union labor and community organizer at LiUNA Mid-Atlantic, says the D.C. Center fills the gap between training and employment opportunities. Many of the area’s other training facilities do not offer a clear pathway to a job, he says. Although the capital is teeming with construction sites, Diaz says he often encountered overqualified workers with skills certificates who were unable to find employment. At the beginning of next year, the D.C. Center will roll out its apprenticeship pilot program, ApprenticeShift, which trains Black workers to code. As part of their fundraising, they’ve asked the city’s workforce investment council to divest nearly $3 million from failed work development programs and reallocate the funding to the tech initiative. Wilkins says the program will go forward without it, but they’re not sure how long it will last if they don’t have that support. It’s not just people from the Black labor movement who favor the centers. Cultural workers, like vegan chef Elijah Joy, joined the D.C. Center as an advisory council member to network with others and to learn about worker cooperatives. He dreams of one day starting a food co-op that embraces local produce, Black culture, and personal history. Food deserts are common where the Center is located in Southeast D.C.
“What I see in D.C. is that there’s a lot of need, but there’s also a lot of people doing great work,” Joy says, but he found that similar organizations rarely shared ideas. “They all have the same goal: more access for housing, more clothing, more food, more shelter.” He plans on using the organizing skills he has learned at the Center to collaborate with organizations aimed at improving African American residents’ health and wellness. It’s been only two years, and the D.C. Black Workers Center has offered job skills training and moral support to hundreds of African American men and women, and has even helped some of them find jobs and start co-ops. And although it focuses on helping workers find employment at outside establishments, some members have been hired as staff. After being rejected for several jobs in his field because of his criminal record, Wilkins was recently hired by the D.C. Center as an organizer. What’s paramount in the fight for economic empowerment, Wilkins says, is that everyone at the Center has a voice, and works together to address the needs of the community. “Building economic power in D.C. is necessary to gain the liberation that I want,” he says.